Since 1980, DamarDirect has supplied Banks, Credit Unions, Casinos, Armored Carriers, Retailers, Hotels & Resorts, Museums, Sports Facilities, Amusement Parks, and Schools. We partner with the leaders in technology and manufacturing to provide only the finest products. DamarDirect is a Certified WBE Company. Discount Paper Rolls for POS, Proof Machines, ATM paper rolls and ATM receipts. Ribbons and cartridges for today's printers at discount prices. We support all machines requiring thermal or bond paper rolls, teller machine paper rolls, POS and printer paper rolls including ATM rolls. Discount ATM supplies including low prices on ATM card protectors and CardBooks®. We offer a full line of teller supplies including coin wrappers and currency bands, lobby supplies, and proof supplies. Counterfeit detection supplies; UV lights, counterfeit detection pens, and fingerprint pads. Coin counter paper rolls and ribbons, all at discount low prices. 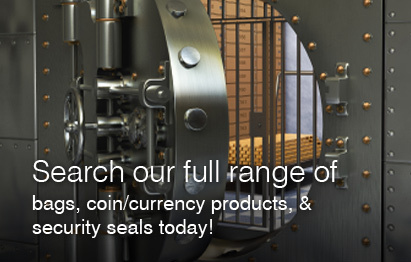 Our vault supplies and cash supplies for coin bags and currency shipping bags are second to none. Contact us for your plastic coin bags and tamper evident currency deposit bags, all FedCash® Compliant shipping bags. We carry a full supply of security seals, truck seals and tamper evident seals. We feature a full line of courier bags from transit style bags to fire proof styles, with locks or without locks to handle all of your courier needs always with your security in mind. Damar Direct is your Discount Plastic Bag headquarters with a complete line of "in-stock" and custom bags, plain and printed. We are your single source for Discounted Plastic Bags. Mailroom supplies including mailroom carts and mailroom furniture, and material handling for your mailroom and warehouse. We offer a complete line of filing supplies, shelving and filing folders. Damar Direct Ltd. understands �Your Satisfaction is Our Reputation�, we do not compromise your security or quality! Poor performance of your transaction equipment is easily solved with the use of our maintenance cleaning products!